Virtual reality presents a tremendous opportunity for everyone to experience beautiful, immersive environments from the comfort of a chair. This experience can be incredibly involving as the most promising VR headsets available today allow their users to interact with the virtual worlds completely they’re exposed to. Talking of flagship VR headsets, there are currently a few on the market that deliver an authentic VR experience. These include the famous Oculus Rift, the HTC Vive and the PlayStation VR. Smartphone manufacturers like Samsung and Google have also hopped on the VR bandwagon with their Gear VR and Daydream VR offerings. None of these can hold a candle to the likes of the Rift and Vive though; they depend on insufficient mobile processing power. Hence they’re only able to deliver a fraction of the experience. You might have heard someone talking about how amazing their Gear VR is, but that’s not the end of it. Mobile VR headsets are mere shells with special lenses that display content that’s being shown on a smartphone screen. They sorely lack in graphical fidelity and user interaction with the virtual environment. Granted, mobile VR headsets are incredibly cheap (costing as low as $20), but they’re not the best at showing off what VR is capable of. For a proper VR experience, you’ve got to have tethered VR headsets like the Rift and Vive. What Are Tethered VR Headsets? Tethered VR headsets depend on computers to do the heavy lifting like graphical and computer processing. The amount of processing power these headsets require doesn’t come cheap, however. You’re expected to have a computer with a powerful processor and graphics card (a PlayStation 4, in PlayStation VR’s case). Also, unlike mobile VR headsets, tethered VR headsets have built-in screens and onboard sensors that drastically improve image quality and head tracking. Because of the sophisticated hardware that’s in a tethered VR headset, the price, naturally, also goes up. Expect to pay at least $400 for the cheapest models. Combined with the cost of a robust VR-ready PC, this requires a hefty monetary investment. Costly or not, VR provides a new dimension in computer entertainment, and every technology enthusiast should try it. 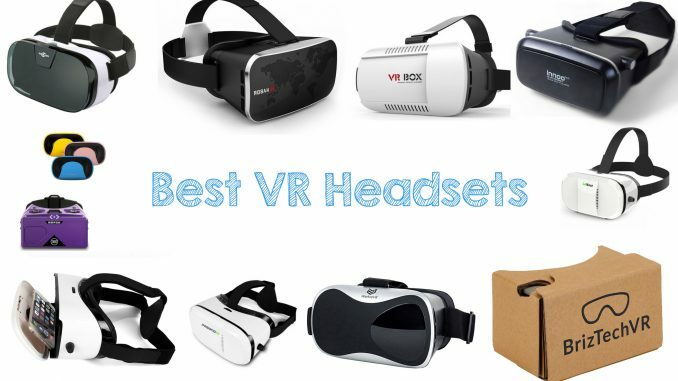 In this article, we’re going to look at some of the most promising VR headsets available today. The HTC Vive aims to provide a complete VR experience with its included headset, two motion controllers, and two “base stations” for defining a “room area”. These base stations are really what sets the Vive apart from other headsets. While other headsets are limited to tracking your movements from the limitation of your seat, the Vive can track changes within a 10-foot cube, as defined by the two base stations. The HTC Vive is pretty resource-intensive, thanks to its high resolution 2160×1200 pixel OLED display with a 90Hz refresh rate. The screen provides a natural 110-degree field of view, and the 90Hz refresh rate keeps the dreaded screen-tearing issues to a minimum. As you can see, a computer with the above specifications combined with the Vive’s (reduced) $600 price tag will be hard to look past. But at this time, this is the best VR experience on offer. If you are serious about virtual reality and are ready to invest in it, the HTC Vive is the one to buy. The Oculus Rift is perhaps one of the most widely recognisable VR headsets out there. Think of VR, and you’ll somehow be reminded of the Rift. Unfortunately, its popularity hasn’t kept it from being overshadowed by the successes of the HTC Vive and PlayStation VR. However, that doesn’t mean there’s little behind the hype. Facebook is the owner of Oculus, after all, and the Rift is still one of the best ways to experience VR with its impressive hardware and intuitive Oculus Touch motion controllers. Why would you want to buy the Oculus Rift over the HTC Vive, you ask? Well, it’s cheaper by $100. The $100 you save here can mean getting a better graphics processing unit, and that’s one of the most crucial requirements of a great VR experience. As for the viewing experience, the Rift’s display has the same specifications as the HTC Vive. The screen has a resolution of 2160×1200 pixels (1080×1200 per eye). Like on the Vive, the display uses OLED technology so that the blacks are deep enough for the eye not to notice the colour. The only area where the Oculus Rift lags behind compared to its HTC rival is in tracking movement due to the lack of whole-room VR. However, the included motion controllers are excellent and deliver a seamless experience. We recommend the Rift to anyone looking for a cheaper alternative to the HTC Vive that provides a comparable graphical fidelity and control experience. The PlayStation VR has been around for a couple of years now, so it’s not at the cutting edge of VR technology. With a single display for the headset that outputs a lower resolution of just 1920×1080, the graphical fidelity isn’t on the same level as the Vive or the Rift. But that’s not the point. The PlayStation VR represents the most accessible way for people to experience quality VR. The PlayStation VR does not need a powerful PC to power it. Instead, it’s powered by the PlayStation 4, which is now available at very affordable prices. Compared to the 1000+ dollars you’d need to spend on a VR gaming PC, the PlayStation VR is an incredible value. The PlayStation VR does require additional accessories like the PlayStation Camera and PlayStation Move controllers actually to work. For convenience, you can get the complete PlayStation VR bundle (which includes the headset and the required accessories) for $449. Even at this price, you’re spending way less than a VR gaming PC. Other than being affordable, another advantage the PlayStation VR has over the Vive and Rift headsets is game support. While HTC and Oculus have to go after game developers for VR support, the PlayStation VR gains natural support with the help of Sony. Sony just has to put a VR requirement on games that are published for its platform, and that’s it. The PlayStation VR is not the absolute best VR experience out there. But it is a great VR experience, and for most people, that’s good enough. Not only is it relatively affordable but it also has the support of Sony behind it, which means it will continue to receive game support for years to come. For anyone looking to get into serious VR for a reasonable amount of money, the PlayStation VR headset is the obvious choice. Virtual reality is a phenomenon that isn’t going away anytime soon. In fact, it has only begun to shine thanks to advances in computational and graphical processing power. The main problem with VR in the past was that consumer computer components were simply not able to provide the amount of computational horsepower required to drive resource-hungry VR headsets. But with fast and affordable GPUs like the AMD RX480, that has become less of an issue. With big companies like Acer, Dell, HP and Lenovo working on VR headsets of their own, the future of VR looks quite promising and the most promising VR headsets available today will only keep on developing.